I think I'm going to go out on a limb here and try to place an age on crabs based on their size. We know you can't tell the exact age without counting the rings from the base of their antennules. We know that you can't tell age from the size of the BP or legs, because they might be smaller when regenerated. We know they might have fewer molts during times of stress. But generally, we should be able to place a rough age, plus or minus a couple years, on a crab based on their general size. It doesn't have to be exact, but it's nice to have some way to place a guess as to our crabs' age. This scale is for PPs. Other crabs which probably follow a similar scale are Violas, Cavs, Brevies, Straws, Blueberries, and spinners. Tiny is around marble to quarter. Tinies around every few weeks to 2 months. 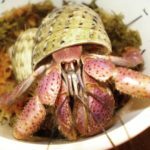 By the time a crab is a medium (7yr), they may have molted (tiny 28 times, small 16 times, medium 7 times) 51 times by my estimate. And that doesn't count the time time spent as "ants" which may have had another dozen molts before they walked off the beach in a shell. As always, crabs will often postpone molts in times of stress, so actual molting frequency may vary. Any help in refining this will always be appreciated. Stuck-up, half-witted, scruffy-looking crab-herder since '92. This was an interesting read. Thanks for posting. That's great! I've always been curious about how old my crabs really are. I've wondered about age too. Thanks for posting the information. Interesting to learn that my Sophie is already 10 to 15 years old. JediMasterThrash wrote: We know you can't tell the exact age without counting the rings from the base of their antennules. Doesn't that just tell you the number of molts and not age? I have had a really miniature PP for over a year and a half and he is still smaller then a dime. I think to get to a small size it would be at least 6 years just my opinion though. Very informative. I am bookmarking this post. hmmm...i think it may even be harder than that. it seems that a crab's growth rate differs from species to species and crab to crab. for example, my Es don't seem to grow as fast. quite a few have molted with me and don't seem noticeably larger. another example would definitely have to be the three smalls that dug down at once and molted. two of them came out not very different from the way they went in, and one of them had to at least double in size. i couldn't see a trace of him in the shell he picked before, but after, he couldn't tuck far enough to hide his BP. i don't know if it's limited to this one molt and maybe he had more nutrition stored or something, though. my large-medium molted and i didn't notice O__. but then this is the same crab that refuses to come out for me under any circumstance. rambochu wrote: for example, my Es don't seem to grow as fast. quite a few have molted with me and don't seem noticeably larger. Huh, I find my E's grow significantly with each molt whereas I can barely tell with say a PP. i think hermits molt a few times, then have a really big growth spurt after a 3rd threw 5th molt, then the cycle restarts. kinda like people some hit a growth spurt after growing a little and some dont grow alot. no offence to short people. Can you expand on this a bit or post a link? I've been wondering about it! Thanks! In general, large crabs are older than small crabs. The only way you can accurately estimate your crab's age is if it dies. Then the otoliths, small concretions of mineral deposits, which sit atop the crab's balance organ (located at the base of each antennule), need to be removed. The otoliths can be sectioned and the number of growth rings counted. Great post, I always wondered. At what age do they start breeding? Same as in fish - tear apart the inner ear upon death and count the mineral rings. I don't think I could ever bring myself to do that when they died!